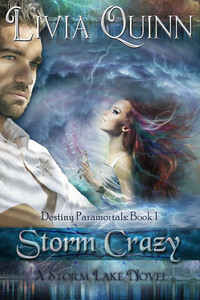 Storm Crazy (Book 1) by Livia Quinn is currently Free. Livia Quinn is a DC native transplanted into the heart of Louisiana. Inspired (or terrorized) by the severe weather in the South, she started writing her Storm Lake series the summer of Katrina. She’s written 9 books based in the communities of Storm Lake - Destiny, Larue, and Thunder Point. I can’t say I have a favorite although I love the edge and the extra escape value paranormal adds to a story. When I need to relax though, I’ll pick up a historical romance since I can resist the urge to analyze them knowing I couldn’t write one if I wanted to. Magic happens everywhere to some extent, so on my lake you’ll find both of these genres. Storm Lake West - Destiny - has a community of supernatural defenders, while in Larue and Thunder Point (Storm Lake East) you’ll meet the military heroes of my contemporary romance titles. Well, Jamie Fraser aside, it would have to be Roarke, J.D. Robb’s hero. Here again, the paranormal/futuristic element of this series lends so much to his persona. He’s got it ALL, including his own planet. And it doesn’t hurt that a Roarke and Eve book comes out several times a year. Take These Broken Wings is book 5 in the Destiny Paramortals which will be out in a couple months as well as the sixth book, Bad Moon Rising, toward the end of the year. In addition, the next book in the Storm Lake East series, Eye of the Storm is coming up in the Fall. Hey, friend! Been offline fixing PC problems almost all day. So glad you could make it! Me, too. WIth so much rain in Louisiana the internet has been spotty at best. Just more inspiration for the series, :) Thanks for hosting me.